Police say at least six people were killed as militants plowed a van into a crowd on London Bridge, and then stabbed others. Eyewitnesses describe horrific moments including when the assailant drove towards them on the bridge, when their son was stabbed and finding shelter in a restaurant as the horror played outside. 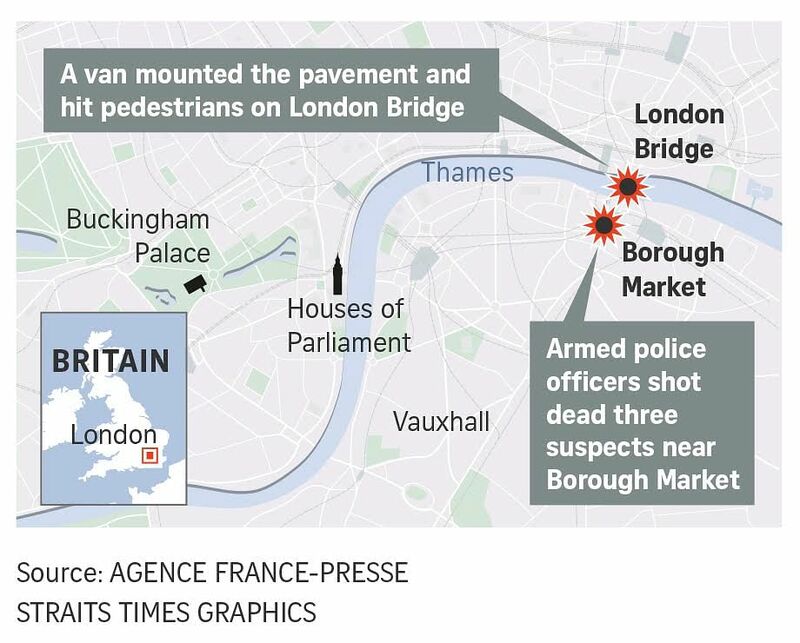 British police rushed to several incidents in central London on Saturday after a van ploughed into pedestrians on London Bridge and reports of multiple stabbings in the nearby Borough Market area. Eyewitness Gerard Vowls, 47, was watching the Champions League final at the Ship pub in London's Borough when the terrorist attacks happened on Saturday night (5.10am Singapore time on Sunday). He was at the start of the south side of London Bridge and saw a woman being stabbed by three men, The Guardian reported. "I want to know if this girl is still alive," he said. "I've been walking around for an hour and a half crying my eyes out. I don't know what to do." Mr Vowls said he threw chairs, glasses and bottles at the attackers in an attempt to stop them. "They kept coming to try to stab me… they were stabbing everyone. Evil, evil people." Reports first came in of a white van mowing down pedestrians on London Bridge, before armed police officers were called in to respond to reports of stabbings in Borough Market. Shots were fired and an attacker, with canisters strapped to his body, was seen lying on the ground after being shot by police. Security officer Tim Hodge, 37, who works at a nearby office building on the south side of London Bridge, saw "huge crowds" running past, screaming. "There was so much panic and so many of the people were drunk which made them more hysterical," the New York Times quoted him as saying. Mr Alex Shellum, who was in the Mudlark pub below London Bridge with his girlfriend and two friends, described an injured woman coming into the pub. "She was bleeding heavily from the neck - it appeared that her throat had been cut," he told the BBC. Meanwhile, Mr Owen Evans, 39, was in the Wheatsheaf pub near Borough Market when gunfire broke out nearby. He said: "I was in the back of the pub. A wave of about 30 people ran in and tried to get into the cellar or cupboard. Then there were shots outside. They didn't seem real - like a kid letting off firecrackers. We saw police lights and everyone got down under a table. People turned tables over. "We waited about 10 minutes or so, with several shots every couple of minutes. Someone at the front of the pub had been shot - it's speculation but we thought it was by accident, there were bullet holes in the windows. "The people near the person called for a medic, shouting: 'He's f**king bleeding to death, we need a doctor.' The bar staff were amazing, I think they locked the door so no one got in. "Then they told us to leave the pub and to run, and a policeman standing outside with a gun was shouting, 'Go, get the f**k out.' We ran down the street, turned left at the Market Porter, than ran down the road and away. We got to the South Bank and then waited ages for a tube, and eventually got home." Tourists have also been stranded in the city after areas where they were lodging were cordoned off by police. Elaine and Louise from Lurgan in Northern Ireland had been to the Olympic stadium in Stratford to see Depeche Mode. They were staying at the Premier Inn on Bankside but have not been able to return to their hotel due to the police cordon, The Guardian reported. "Now we're stuck in London with nowhere to go and no sense of direction and sore feet," Louise said.